My nails today where a bit of an experiment, I needed to something to take my mind off something rather upsetting that happened yesterday. But nails first! I’ll say a little about what happened at the end of this post. I started off with a simple black and white french tip, I used A England Camelot and SinfulColors Snow Me White. Then using a large dotting tool I added the first layer of dots along the line of the french tip, then using a medium sized dotting tool I added the next lot of dots. After they had dried I applied a thick layer of Seche Vite. 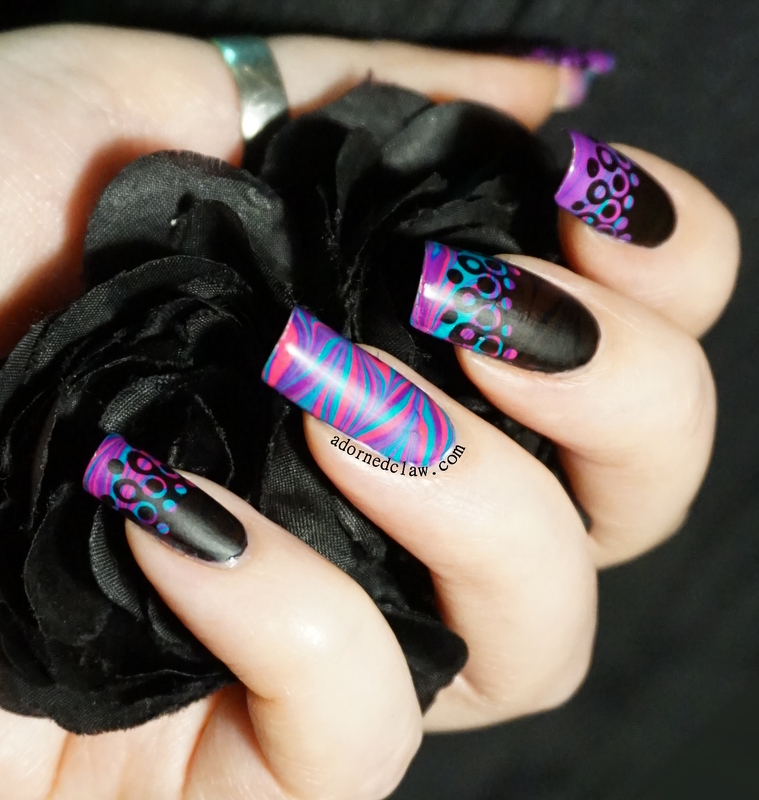 For the watermarble I used OPI Color Paints. Magenta Muse, Purple Perspective and Turquoise Aesthetic. Then I finished it off with a coat of Illamasqua Matte Topcoat. 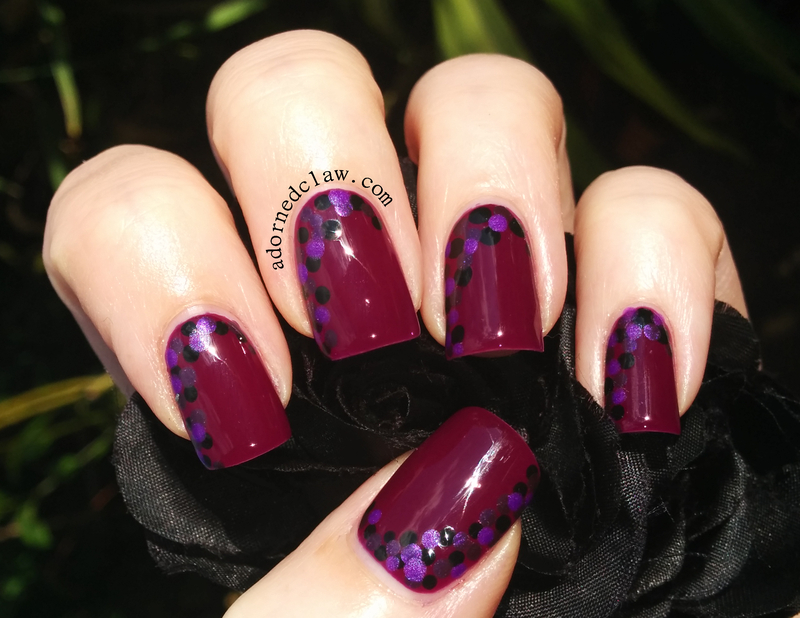 This mani ended up being way better than I was expecting! 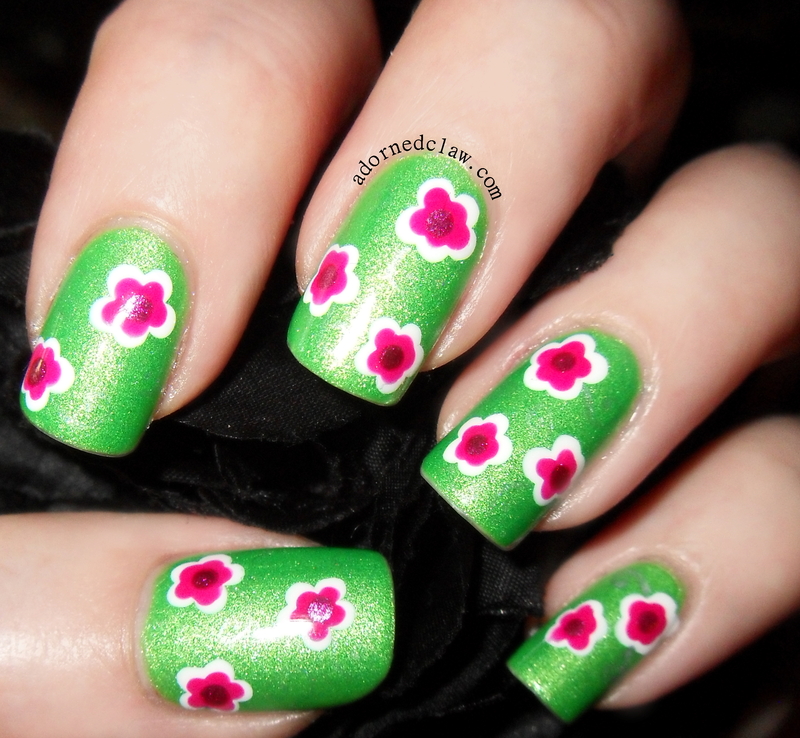 But you could get the same effect by stamping over a watermarble lol. My unhappy news (I’m not going to be offended if you want to stop reading now). I had to have one of my Ratties euthanized yesterday 😦 Wednesday night he lost the ability to stand and started having seizures. It my vet said that it looked likely that he had a very aggressive brain tumor, and that his symptoms would only get worse. I know having him pts was the kindest thing to do, but I’m still shocked at how quickly it happened. Up until Wednesday he was one of the biggest, strongest, healthiest, bouncy ratties that lived here with me. It’s very sad but I know he’s not in pain, and that he’s had the best life that I could provide. Sleep well Mr. Seth. I’m going to miss you little buddy. 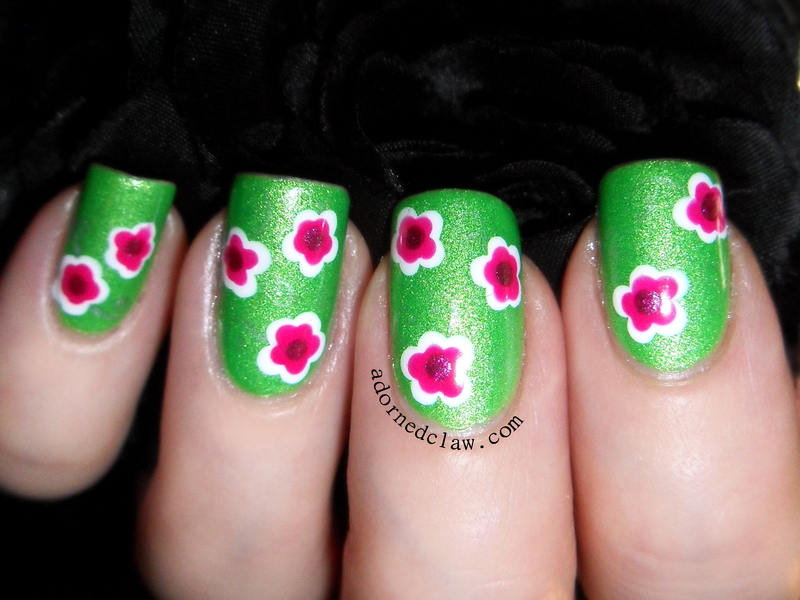 Today I have some really easy Spring Flower Nails to show you all! 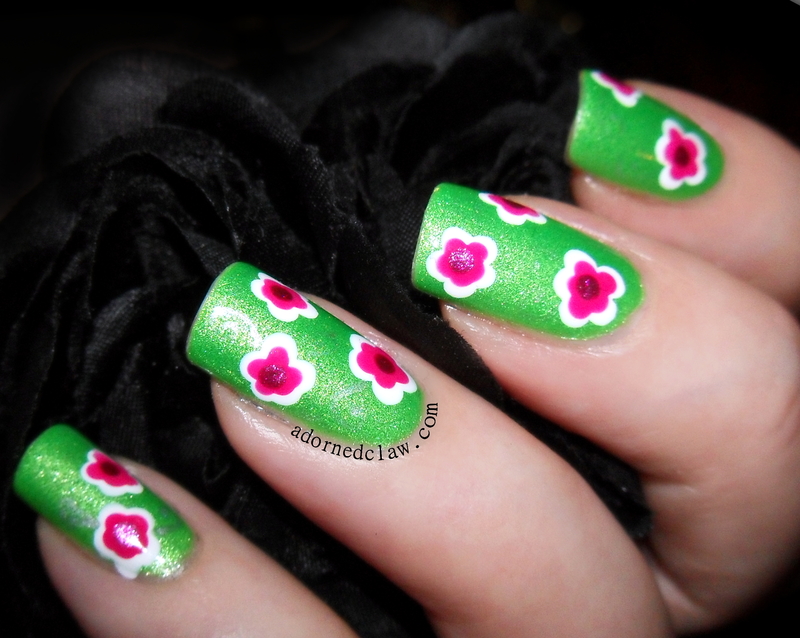 I was going to post this cute mani on Friday, but I ended up not having the time! This is the first time I have tried Omen, it’s amazing! So green and sparkly! it dries really quickly to a lovely satin finish too! For the flowers I used a medium and small dotting tool starting with Snow Me White, I used the medium size dotting tool and placed five dots in a circle, then with the small dotting tool i added the Shocking Pink and a final dot of Hot Like Lava in the middle. I don’t think I have ever experienced vanishing nail art before lol. But I still like this even without the silver! I have never used nail strips before, so this was definitely a new experience for me! 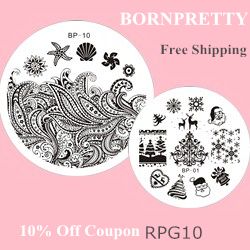 First I have the Grey Pollock design to show you, and you can find these right here http://www.omgnailstrips.com/nail-polish-strips/black-pollock-nail-strips. The first strip I tried I managed to mess up terribly! lol so after reading the instructions and watching the Video right here I removed it and started again. These are really sticky, so if you mess one up, make sure to remove it with polish remover, I tried to picking the strip away and took a layer of nail off too Oops! My second try worked really well! no creases or bubbles, applying all the strips took less than 5 minutes! This picture was taken after two bowls of washing up (no rubber gloves) a shower and making some biscuits! And as you can see the wraps are still perfect! I don’t know if they will last for the 10 days, but from what I put them through I think they will last a bit longer than a traditional polish mani! Another fun thing about these polish strips is that you can cut them into what ever shape you would like! 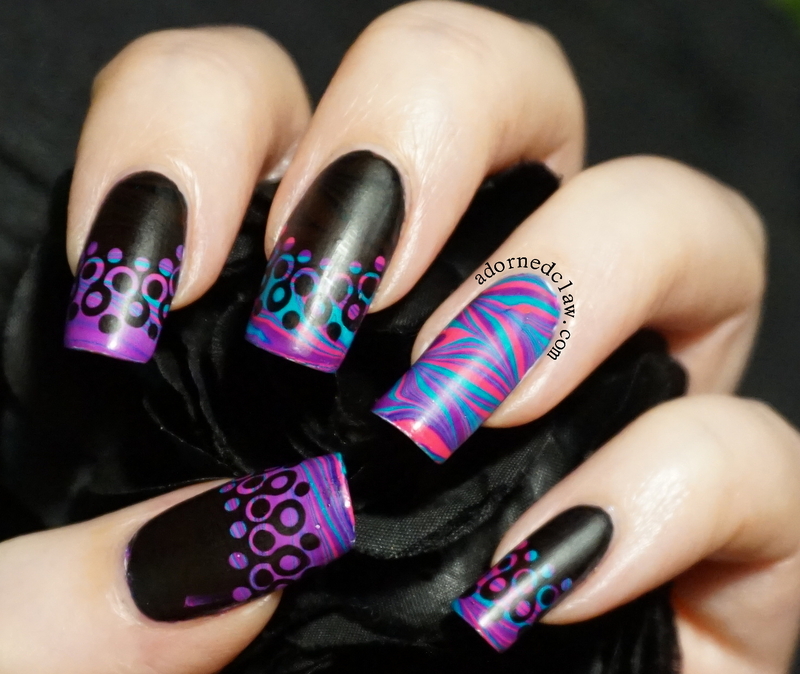 For the little circles I used the two largest size strips, I found they are too big for my nails and I would have to cut them to size if I wanted to use them anyway. I used my hole punch! 🙂 then peeled away the backing and applied them to my nail. Even after using the largest I still have enough left for a full mani using them! The black polish is from Barry M and I used a layer out the door topcoat. These nail strips currently retail at $7.99 a pack (that’s around £5 in the uk) there is also an offer for 5 packs for $25 using the code 5pack and 10 for $45 using the code 10pack there is also free international shipping! I have to say I really like that each strip has the width measurement in mm, it makes selecting the correct size for each nail much easier, although I did find that they are a touch on the large size, so if you have small nail beds you’ll have to do a lot of trimming! 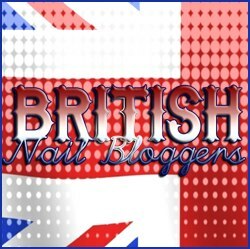 Today I have a Ruby Wing colour changing dotticure to show you! I picked this bright pink one up in my local Sally’s and the shade is called Crowd Surf. I applied two coats of Crowd Surf over my usual base coat, the formula for this polish is lovely and it dries really quickly which is always a bonus! For the dots I used a medium dotting tool with Barry M Black, Orly Velvet Rope and Poke from Illamasqua. I really thought that it was only going to change colour a little bit. I was really surprised that it actually changes to much! I really like the dark purple shade! 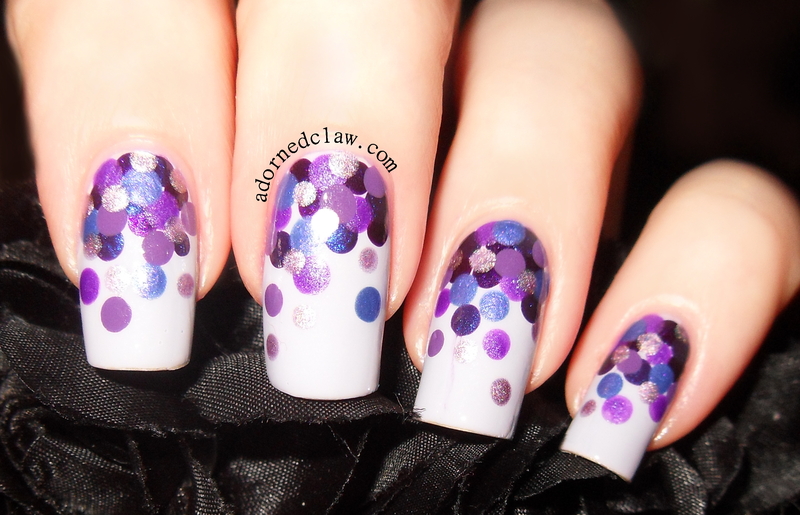 These are my dotty nails for day 11! 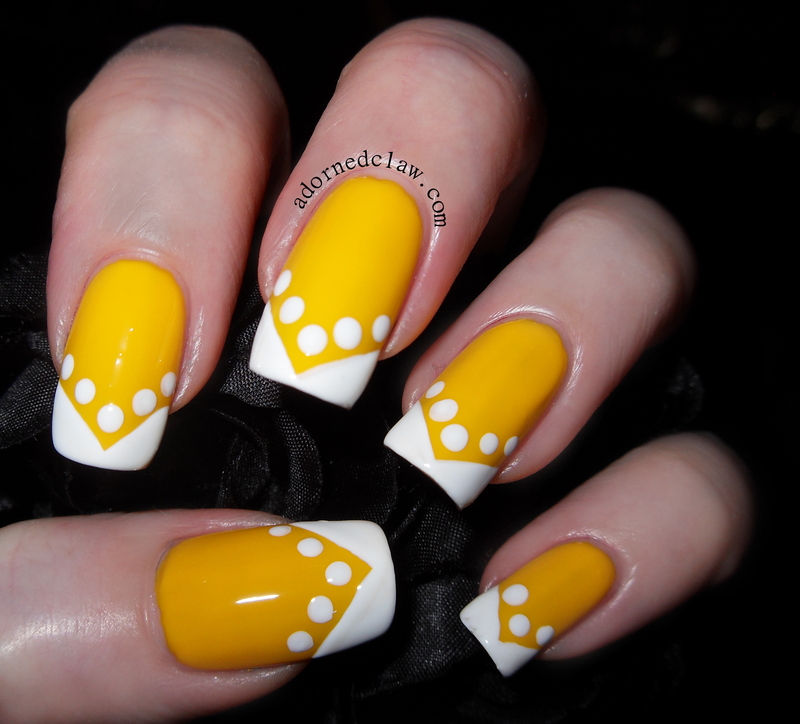 Here are my yellow nails for day 3 of the 31DC2014 challenge. 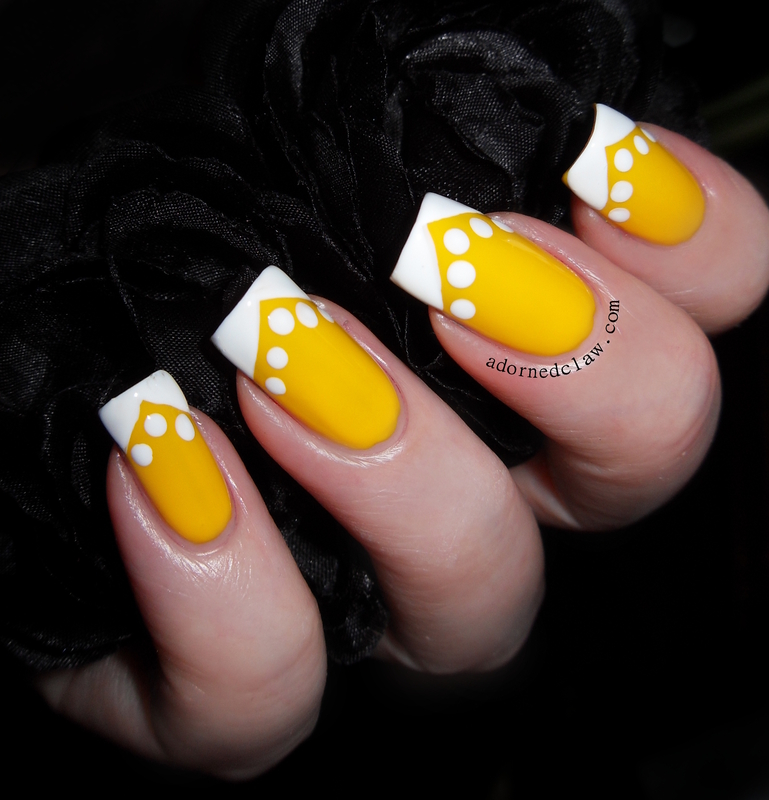 for this I started with three coats of Electric Yellow from Maybelline Color Show, then I used White On White from China Glaze for the freehand V shaped french tips, then I added the dots with a medium sized dotting tool!